No, your eyes are not playing tricks on you. 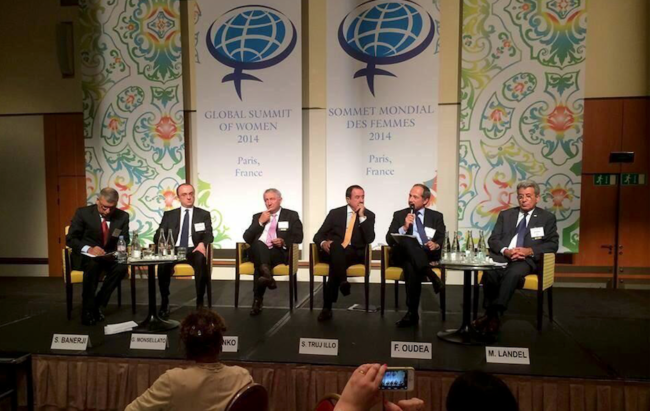 The image above really DOES say “Global Summit of Women” and the panel photographed really IS made up of white men. 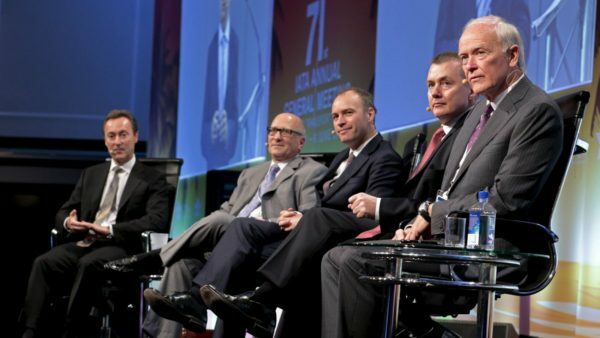 If you have heard of the brilliant Tumblr site called All Male Panels, you will know this is not an isolated event. There is a curious phenomenon that has been happening for a while where women are conveniently and routinely excluded from panels and conference speaker line-ups which can only really be attributed to sexism – whether intentional or subconscious. 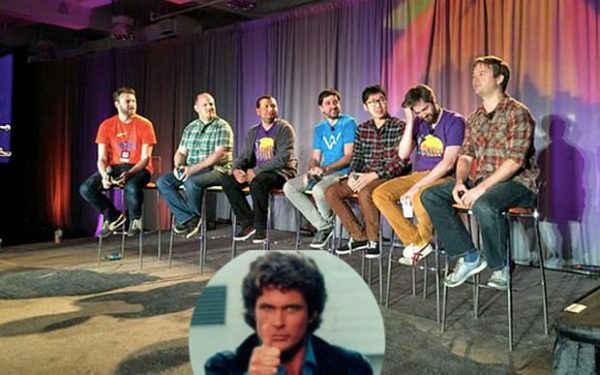 The Tumblr account was created by Finnish academic Saara Särmä, who regularly posts images of various all-male panels happening around the world, and adds a disapproving David Hasselhoff image for good measure. While this account is important and hilarious, what we need to see is action. Enter five in-demand male Australian speakers who have become aware of this insidious phenomenon and have decided to rectify the situation, like the woke baes they are. The men—Matt Church, Jason Fox, Adam Fraser, Dan Gregory, and Darren Hill—are researchers and lecturers in leadership, performance, motivation, and self-help, according to Quartz.com. No doubt inspired by the spate of hashtags, conversations and movements about all-male panels online, these men have pledged not to accept any speaking engagement that doesn’t promote a diverse speaker line-up. Can we get a “hell yeah!”. Dear readers, this is exactly the kind of action that exemplifies the He For She movement, and it’s what encourages us in the knowledge that there are men who recognize the value and importance of gender equality. In an interview with the Sydney Morning Herald, the men explained their reasoning and purpose behind this pledge. “We often see full male panels at conferences. In general, there is a lack of diversity, and sometimes we see those male panels talk about issues around women. So you have privileged white males talking about the challenges that women face. It’s insane,” said Dr. Adam Fraser, who has seen his fair share of non-inclusive panels in Australia. An incident that drove this momentum into overdrive was a Paypal “Gender Equality and Inclusion in the Workplace” panel hosted by PayPal’s diversity and women-in-tech group, Unity. The panel consisted of 5 men, some of whom were not Caucasian, so that was a start, but it by no means exhausted the full spectrum of what gender equality and inclusion actually means. The image was shared by former advertising industry executive Cindy Gallop, and caused a huge ruckus online, being shared over 600 times. A spokesperson for the organization claimed the point of the panel was to promote male allies, and that crucial information about the intent was left off the flyer. That may have been the case, but sadly the damage had been done, and the negative narrative stuck. Around the same time, Sree Sreenivasan, the chief digital officer of the Metropolitan Museum of Art, wrote an announcement on Facebook that he would no longer be participating in all-male speaking engagements either. Starting his post with the words “LEANING IN!” he explained how it was his 12 year-old daughter who inspired him to make this pledge. “My 2016 pledge to my daughter: I won’t speak on any all-male panels (one-on-one chats are occasionally OK). Upgraded now to include not ATTENDING all-male panels. How do we make this into a mini-movement?” he asked. It turns out Sree’s message was already part of a movement that is going global, and the five Australian men taking the Panel Pledge are stepping it up down under. Rather than being seen as trying to hijack the leadership of this unofficial movement, these men say they are simply using their position of influence to create change where they see it needs to be made. “The five of us are arguably the most booked speakers in the conference industry, and that gives us a certain amount of power in the conversation,” said Dr. Dan Gregory, a behavioral researcher. Motivational scientist and speaker Dr Jason Fox says whenever he received a request to speak, he immediately asks who else is on the panel or the line-up. 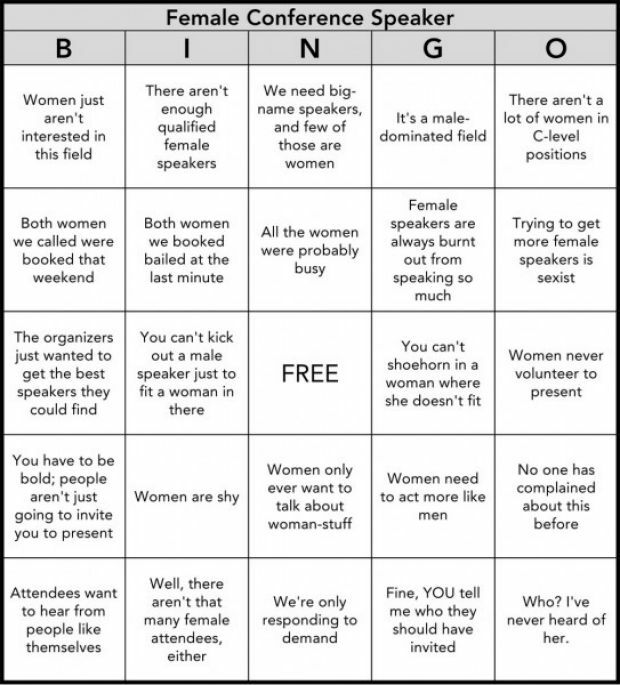 If there are no women present, he sends them a very helpful “female bingo” chart which lays out all the excuses people make to not be inclusive, and also refers them to the All Male Panels Tumblr account. He doesn’t look at this as forcing “tokenism, either. He was part of an organizational committee for a recent conference, and his team worked hard to ensure 50/50 gender representation on the stage. “It was too important for us not too. And it is too easy to default to having a bunch of dudes and having a dude fest,” he said. Men speaking out about the importance of doing their part to further gender equality doesn’t fall on deaf ears, as one prominent world leader’s statement after winning an election made a huge impact on these five men. “There are plenty of women who are experts in their field and highly talented speakers. And, to steal a line from Canadian Prime Minister Justin Trudeau, ‘it’s 2016’. The thing is, research tells us diversity makes groups smarter, so why are we dumbing panels down?” said Dr. Gregory. A London-based development economist, Owen Barder, started a pledge of his own in 2015, after getting sick of only being part of all-male panels. “Whenever I’m invited to be on a panel, I can almost always think of a woman who would be better than me,” he said. If there are no women on the panel, he declines the request and refers them to women who could adequately take his place instead. It seems this movement to dismantle an unnecessary sexist barrier is starting to make many event organizers take notice. Owen says the invitations to all-male panels are dwindling, and he should know as he daily receives speaking and appearance requests. A group of women in the political science community formed a collective earlier this year called ‘Women Also Know Stuff’ as a way to raise awareness of their existence. They say they are sick of being excluded from panels, TV shows and media interviews where the “expert” is often predominantly male. Their mission is to change the perception of women in an industry dominated by men, while also pushing for more inclusion and representation of women’s voices. With the increase of voices and action steps being taken to dismantle harmful gender norms, we may be on the precipice of seeing major change. 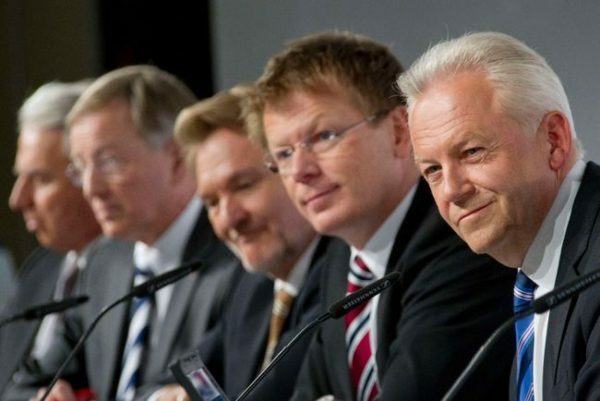 In March 2016 the UN Global Compact executive director, Lisa Klingo, sent out a press release saying it will no longer allow its employees to take part in all-male panels. “Too often, I’ve been the only woman on a panel. It is time that we challenge the status quo and stop making excuses – there is no shortage of qualified women. Achieving the Sustainable Development Goals will require greater equality and opportunity for women and girls everywhere. One practical way to start is by pledging to make both women’s and men’s perspectives heard on stages everywhere,” she said in opening remarks at the Women’s Empowerment Principles annual event in New York. You can keep track of the #PanelPledge movement in Australia, and beyond. If you happen to witness any all-male panel events, or even be invited to speak at one, be sure to share it on social media. The more we can play a part in raising awareness about the need for greater representation of women and women’s voices, the more gender equality becomes a reality.